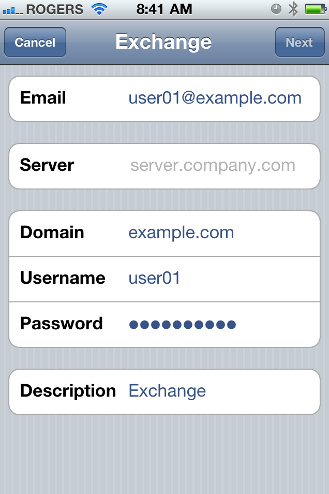 Username: The 'user' portion of your Email address (example: user01). Notice the 'Cannot Verify Server Identity' error and Touch Continue. You will receive an error 'Unable to verify account information'. Touch the account you just added (by default, it's called Exchange). Note: Push is not available for MDaemon 12.5.3 and below. For versions of MDaemon prior to MDaemon 12.5.4, The device needs to fetch the changes either on a timer or as the data is accessed. If you change the settings to Fetch, and set the timer to every 15 minutes (in the above step 15), then you will get changes made from Webmail within 15 minutes without needing to open the application. Go back to the Accounts screen. Locate 'Use SSL' and set the slider to OFF.